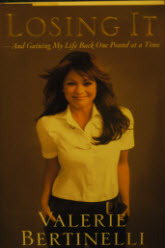 I switched to this autobiography from Valerie Bertinelli and found it to be an interesting insight to one of the people who I enjoyed watching on TV when I was younger.You could almost say we grew up together as she is only a few years older than myself. We spend our time watching celebrities on tv or in movies, but we really don't know who they are at all except for what we see on tv or in movies. Who they are in that realm is not who they really are in life at all. This book really proved that. I always wondered about her marriage to Eddie Van Halen, why she only had one child, and if those stories about rock stars were true. This story is an enlightening look inside that world and into her life. I read it because I wanted to learn about her relationship with food since I m struggling with similar issues as she. It was good to see that despite different upbringings, we weren't that too much different in our thought processes when it comes to food. It gave me hope that I too, one day, will be able to overcome my demons with food.